It’s no secret that launching a fun new app right before South by Southwest can be good for generating buzz. It doesn’t hurt to have acknowledgement from folks like Gary Vaynerchuk while you’re at it. That’s what Meerkat did. They unleashed their live streaming app, and it immediately set the internet ablaze. Meerkat founder Ben Rubin said this week on the WhyISocial podcast that Meerkat’s goal is to dissolve the line between the creation and consumption of content. He believes that everyone has a story to tell and that people want to be connected and take part in one another’s stories. Based on my personal observations over the past three weeks, I’d say he is right. And the fact that less than a month after launch they have 400K users is a testament to people’s interest in the app and in one another. 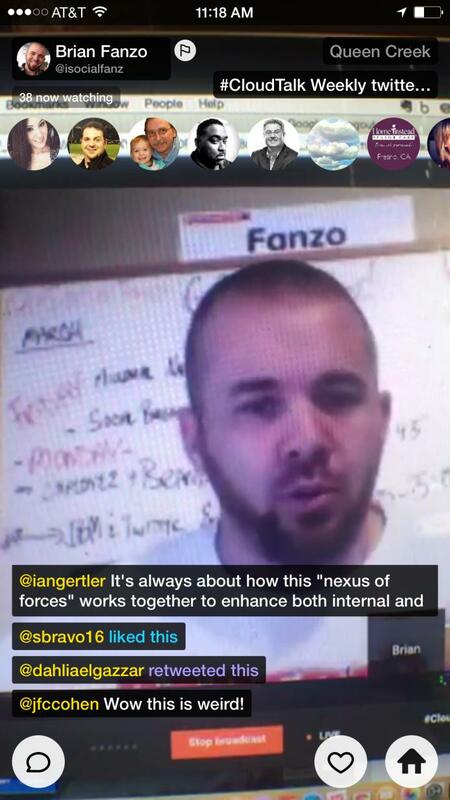 Perhaps the biggest draw for Meerkat is that it is integrated with Twitter. When a user starts or schedules a stream, an announcement and link are tweeted out from that person’s Twitter account. Then during the stream, comments entered in Meerkat by viewers are also posted in Twitter as replies to the originator. This is significant because it amplifies visibility for the app and its users. On the other hand, being integrated with Twitter has its drawbacks. Earlier this month, Twitter cut off Meerkat’s access to its open graph. The result being that as new users registered on the streaming app, their following and followers were not automatically imported. So while the Twitter integration still exists, it’s now more work for users to find one another on Meerkat. So it’s pretty clear that live streaming with social integration is the here and now. What is not clear is who will rule the space. Since Periscope is in beta and I’ve yet to gain access (along with most of the rest of the world), I can provide some insight based solely on what I’ve seen with Meerkat. Gary Vaynerchuk streamed behind the scenes of filming his #AskGaryVee podcast. This was great because viewers could see more of his office, his staff, and the stage for this beloved show. Brian Fanzo streamed what he saw and did at South by Southwest. Fans went wild over this because it was an inside perspective for those of us who couldn’t attend the big event in Austin. He has also streamed behind the scenes during some popular Twitter chats that he hosts and has guested on. Vincenzo Landino streamed everything from karaoke marathons to his morning commute to product giveaways. Vincenzo in particular is a great example of the meritocracy of Meerkat. He wasn’t a celebrity going in, but by consistently streaming, he has stayed high on the leaderboard. Gregg Weiss streamed personal thoughts as well as himself singing popular songs with the lyrics re-written for social media. These have been alternately thought provoking and funny. If none of these examples seem compelling, Jim Keenan wrote this Forbes piece explaining how and why Meerkat is a game changer for salespeople, complete with some strategies for success. There’s another great piece on TechCrunch about how Meerkat is connecting people via empathetic transactions. And a quick search on Twitter will render thousands of results, including Meerkat live streams, articles on the subject, and people generally talking about the idea. As much as people are talking about and using live streaming capabilities, it’s a trend that businesses and marketers can’t ignore. Whether to use it for customer service, product demos, brand awareness, or simple entertainment, it’s clear that there are a number of options and that the audience is already there. Do you watch or create or both? If you’re on Meerkat or Periscope I’d love to hear from you! Find me on Twitter!